When "Goodnight Moon" just isn't cutting it... one dad and novelist has written a bedtime story to warm the hearts of sleep-deprived parents everywhere: "Go the F@#k to Sleep." Most parents can recall a particularly dark and dreadful night when their little one just wouldn’t go to sleep. And most parents have uttered -- in their heads, or under their breath – a frustrated profanity about it. 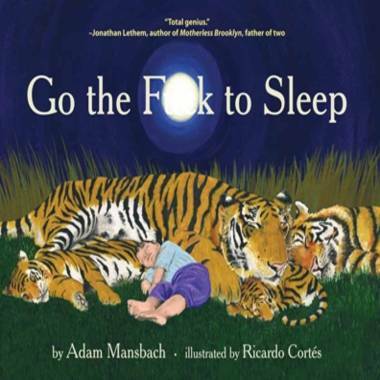 Novelist and dad Adam Mansbach did one better: He wrote a children’s book called "Go the F--- to Sleep." “The cats nestle close to their kittens. Now before you call Child Protective Services, let’s be clear: This book is written and illustrated in the tradition of a child’s bedtime book, but it’s not at all meant for kids. (It says so on the back cover.) The book, which alternates lilting verse with, well, profane reality, is aimed squarely at parents. Mansbach isn’t just another foul-mouthed, wannabe writer – he’s an acclaimed and accomplished author. He’s a visiting professor of fiction at Rutgers University. But as any good fiction teacher will tell you, you’ve gotta write what you know. And last summer, Mansbach knew that it was taking for-freaking-ever to get his 2-year-old daughter, Vivien, to go the f@#ck to sleep. He posted an exasperated lament on Facebook, and his friends told him to write a book. So he did. “Go the F@#k to Sleep” just went to print, so I got a personal, over-the-phone reading from the author. It’s laugh-out-loud funny, capturing perfectly the seemingly endless bedtime routine all parents have endured: the requests for one more story, a glass of water, another bathroom trip, a different teddy bear. It juxtaposes the sweet words we say to our kids on such a night with what we’re really thinking in our heads. Mansbach hopes people will not only relate to the book, but get some relief from it, too. Despite the “tremendous culture of parenting,” there’s a lot that doesn’t get talked about, he said. These days, Mansbach’s daughter is a pretty darned good sleeper. “I would like to think that writing this book solved her sleep problems,” he said with a laugh. “Go the F@#k to Sleep,” from Akashic Books, comes out on Oct. 11. It’s already in the top 300 on Amazon.